I just signed up for this and got 975 Swagbucks ($11.08 if you redeem in batches of 2200 SB for $25 Amazon gift card). The deal requires you to buy a $50 gift card. They have a ton of options, though most of them are things like mid-price/high-price chain restaurants where we wouldn't generally be spending money. They do have several places where most people would spend money regardless, like Lowe's, Home Depot, clothing stores, etc. 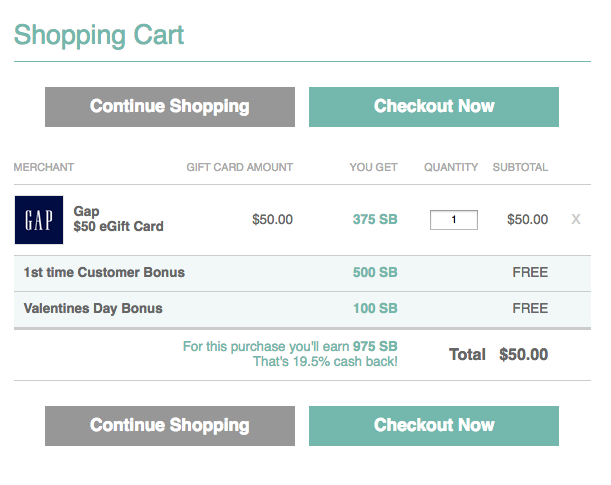 I noticed that the GAP gift card earns you a larger number of Swagbucks than Old Navy, even though you can use the gift cards at both places since they're the same owner. So I bought a $50 GAP gift card, because I typically spend that much at Old Navy a few times a year. If you haven't checked out the huge Old Navy clearance section at South Bay mall, do it! It's the biggest one I've found so far. Women's and men's is in the back corner of the store, and kids' is in a separate section in each kids' section. Old Navy tends to sell things for a very short time before they're out of season or out of style, so there's always a lot on clearance. The stores have more than the website does, because they also seem to move things to clearance as soon as they're low on certain sizes or they want to take down the display. If something stays on clearance very long and they're down to only a few of them, they'll often mark them down to a couple dollars. The stuff is often cheaper than thrift stores, and you can get things that wear out quickly and don't usually make it to thrift stores, like tanktops and leggings. Also, Old Navy is one of the furthest ahead in terms of seasons; right now they mostly have swimsuits and sundresses. This means that the place is pretty useless if you suddenly need snow boots or swimsuits during the correct season, because they'll likely all be gone, but it means things go on clearance before you actually would need them. We've gotten coats and gloves at a major discount when they clear them out in October or so, and swimsuits when they clear them out in about May. So, get yourself a $50 GAP gift card (plus $11 in Amazon money), and go check out the Old Navy clearance section. And if you don't have Swagbucks yet, click the Swagbucks label to find all my past posts, which explain how to use it and contain my referral link so we can both get extra free stuff. Thanks!